Well it took a while to get it to this point with the other bikes i have been building but here she is. Its a 74 xs think it has had some motor work done to her. I picked her up for $600, she was the nicest stocker I have bought. I chopped her up bent the frame rails and welder her up. I took a peanut tank cut 2.5″ out of the center and made my own bottom. I cut out stock gusset and made my own. I smoothed out the frame and flaked her all out. I like the stars so i added military stars. I painted the motor solid black and am adding chrome bolts. 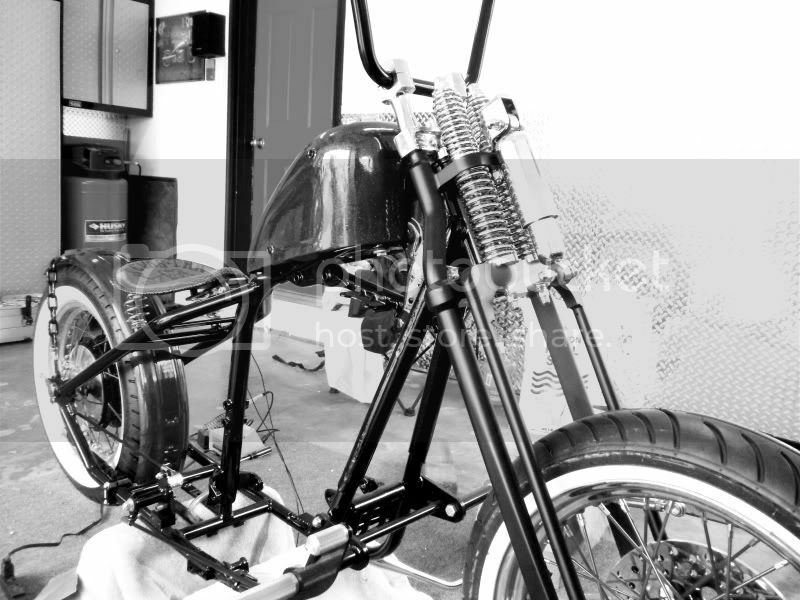 it will have black wraped pipes. I cut the old spokes out powdercoated the rims and hubs. I relaced with stainless spokes. boyer ignition and security camera battery. My buddy did the seat for me with the praying hands and stars. Anyways here is how she sets till my wheels are trued. Then I will finish her up. There’s more pics now? I like the paint. Maybe the carbs should have been blacked out too? I’m thinking about doing that. What’s with the bottles, filters? bottles are just cake toppers. lol i will probably black them out just worried about gas eating paint off. gee wilikers, aNOTHER top-notch intellectually stimulating comment from Mexico Joe… or, whoever. What size bars are these?